The AWT6113 is a high power, high efficiency Amplifier Module for PCS CDMA Wireless handset applications. The device is manufactured on an advanced InGaP HBT MMIC technology offering state-of-the-art reliability, temperature stability, and ruggedness. 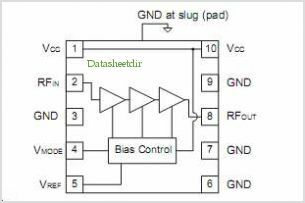 Selectable bias modes that optimize efficiency for different output power levels, and a shutdown mode with low leakage current, serve to increase handset talk and standby time. By Anadigics, Inc. This is one package pinout of AWT6113,If you need more pinouts please download AWT6113's pdf datasheet. AWT6113 circuits will be updated soon..., now you can download the pdf datasheet to check the circuits!